Mrs Walsh sent through a group of budding young artists to talk through their work. 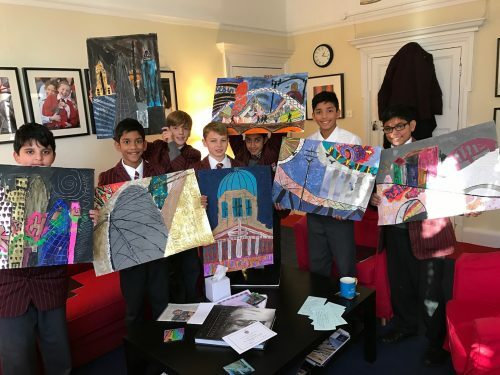 The project was substantial with pupils having to photograph various urban landscape scenes, capturing the perspective and sense of depth and scale. Then using a truly open palette of colours and materials they had to create their own urban landscape. Real creativity and diversity was on display as they all interpreted this is different and unique ways. The highlight that they described to me was being set a ‘cool prep’ as they had to research and come up with their own resources – I suspect that a number of recycling bins were being raided that week! Congratulations to Rishi, Shyan, Henry, Rahil, Elliott, Dev and Sabeh. It was a real and genuine treat to see you all today and to see the progress that you have made since I was your Art teacher! Well done, Tate Modern…here you come!